From engineering and planning to substation construction and commissioning, Equisales offers innovative services that are designed for today’s utility providers. Our electrical engineers and business leaders have more than 100 years of cumulative experience in the global power industry. A complete understanding of dynamics and regulations everywhere from North America to the Asia-Pacific region allows our team to engineer solutions that meet the world’s diverse power requirements. Our extensive substation construction services support the growing demand for electricity. We develop and build customized substations for independent power producers (IPPs), non-utility generators (NUGs), industrial customers and local utility cooperatives. Transmission and distribution substations are a critical part of the expanding electrical grid. As power demand increases, we are designing and constructing more and more customized substations. Our integrated engineering, procurement and construction services deliver additional value to high-voltage clients at all levels of the global power industry. While permanent facilities are being built, rental services support business operations and construction-related power use. Our field-ready substation rentals complement mobile generating units that are gaining market share worldwide. These turn-key solutions have multiple benefits for utility providers and consumers in diverse regions. Temporary substations have been successfully installed at major petroleum refining facilities. In established countries, they can support seasonal increases in power demand. Large-scale rentals are proving to be exceptionally useful in developing nations where pop-up generation and distribution facilities are providing power to under-served areas and communities that have never had reliable electricity. Whether development outlooks favor mobile or permanent infrastructure, we can provide the equipment and services that are needed to sustain the fast-track power industry. We supply all types of substation equipment through sales and rentals. Voltage and instrument transformers are available for immediate shipment along with switches, SF6 circuit breakers and safety controls. We offer additional new, used and refurbished products through partnerships with original equipment manufacturers and leading suppliers. We assemble transformers, circuit breakers and components, and we ship them to global destinations with the machinery and personnel that is required to complete installations. 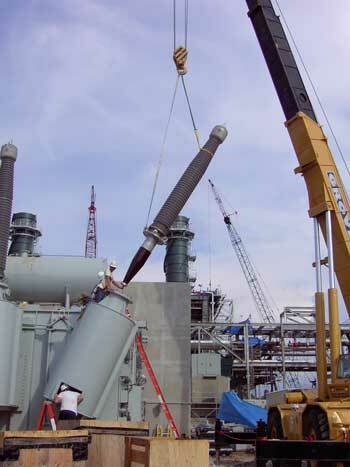 Equisales completes substation construction efficiently by streamlining installation and testing services. Specialized teams organized according to lean principles achieve excellent results. Integrated services allow us to move from construction to commissioning phases immediately. By coordinating project requirements in house, critical tasks are completed on time and on budget. Our fast-track services are ideal for projects with tight deadlines. Plus, best practices for quality control and testing ensure that facilities meet international standards and local regulations in order to go from commissioning to operation without delays. Our turn-key substations and fast-track solutions provide multiple benefits to utility providers and industrial customers. To discover how our EPC services can benefit your local or worldwide operations, contact Equisales online or by calling 713-733-3999.